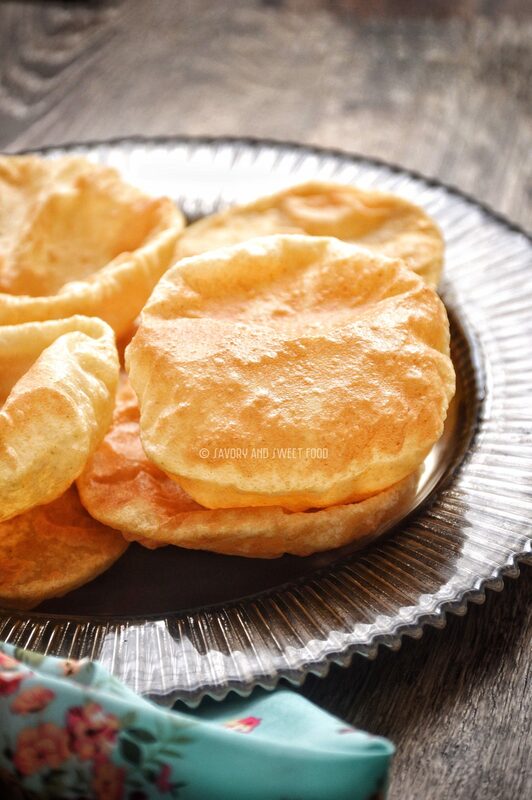 Moong Poori/Puri is perfectly puffed up fried bread, containing the goodness of moong beans. Getting kids to eat good food can be the most satisfying at the same time most stressful part of parenting. Nothing feels better than watching your kids polish off a healthy homemade food. Most kids love pooris. My son loves it. The day I make poori, Hamad’s dinner time will go smoothly. I usually try to sneak in healthy ingredients into dishes that Hamad eats without making much fuss. I make poori with carrots or beans in it mostly. I always try to add some nutritious stuff into it. So I incorporated cooked, ground moong beans into the poori dough, and I kneaded the dough with moong alone, without adding water. I had a fear if the poori will taste weird, but it didn’t have the smell or taste of the beans at all. It tasted exactly like the usual plain poori and it was super soft too. Do give this recipe a try, it is really good. Do not roll the pooris into very thin circles or it wont puff up well and it may turn crispy. At the same time do not roll the pooris very thick too. Unlike the other rotis/breads poori dough need not rest for long. Its always better to fry the pooris immediately. 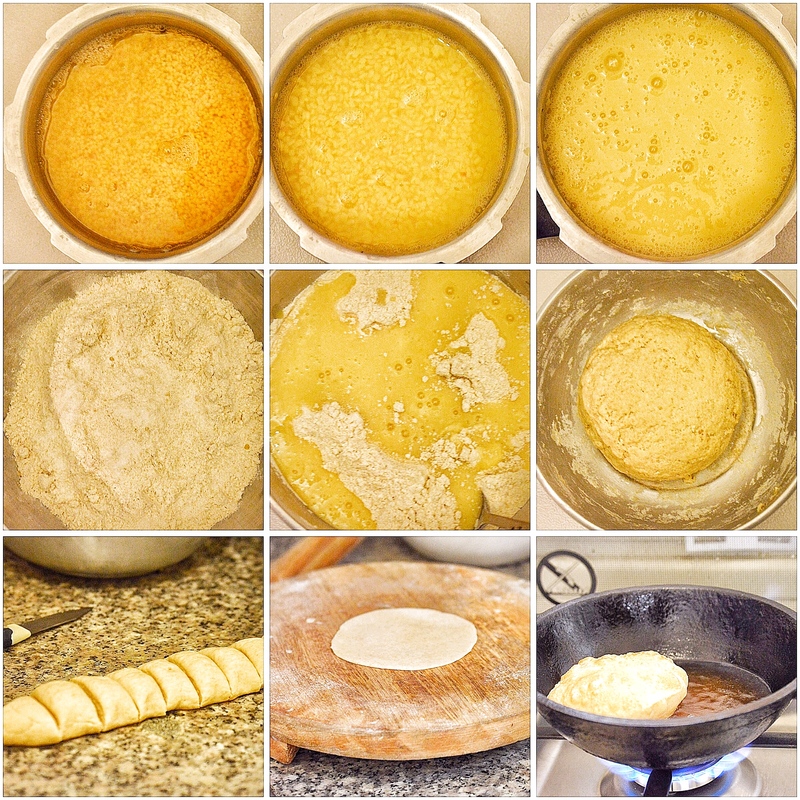 Because as the dough sits for long, the poori soaks up more oil while frying. Make sure that the oil is hot enough when frying, or else the pooris won’t puff up well and will soak up oil. You can add carrots in the poori dough too. Just add carrots along with moong and cook. Chopped methi leaves can be added to the dough too. You can add it directly to the dough, there is no need to cook it. You can add green chillies, ginger, curry leaves, red chilli powder, cumin powder etc to increase flavor. In a pressure cooker, cook the moong beans along with 1 cup of water for 5 minutes. Let the pressure of the cooker release completely and open the lid. Grind the moong well till smooth. In a bowl add the flour, salt and the ground moong. Knead well till you get a smooth dough. If the dough is very sticky add in more flour. And if it is too dry add few more drops of water. The dough should be semi soft, not too soft and not very hard either. Make small balls out of it and roll into thin medium thickness circles. Don’t roll it too thin or the poori won’t puff up. 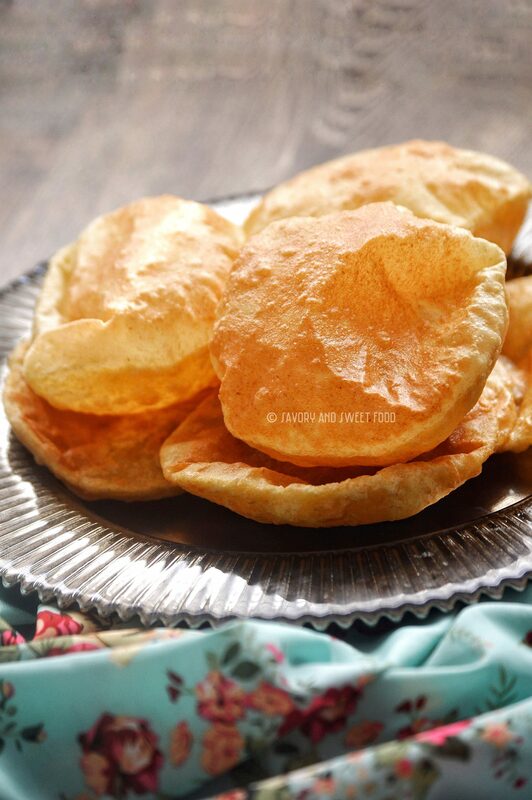 Drop the poori into hot oil and fry on both sides till the poori puffs up and turns golden brown. 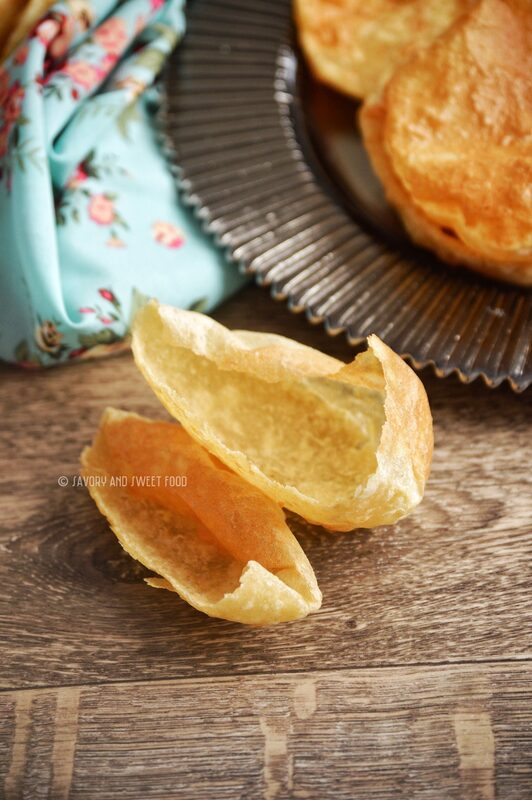 Perfectly puffed up pooris/puris containing the goodness of moong beans. In a bowl add the flour, salt and the ground moong. Knead well till you get a smooth dough. If the dough is very sticky add in more flour. The dough should be semi soft, not too soft and not very hard either. Make small balls out of it and roll into thin medium thickness circles. Don't roll it too thin or the poori won't puff up. 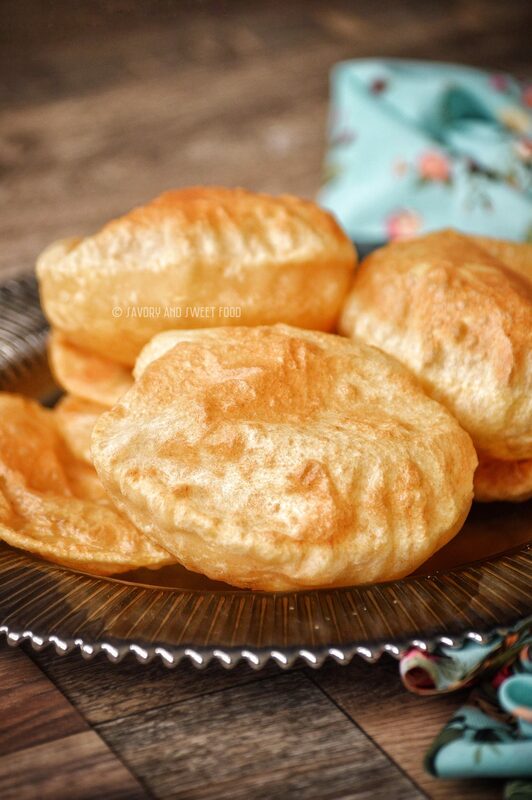 Drop the poori into hot oil and fry on both sides till the poori puffs up and turns golden brown. 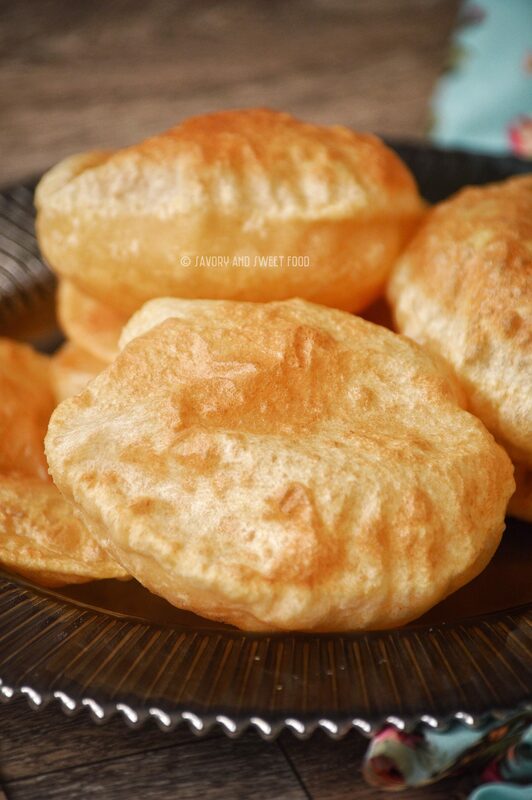 Keep poring ladles of hot oil on the surface of the poori while frying, so that it gets puffed up easily. Make sure that the oil is hot enough when frying, or else the pooris won't puff up well and will soak up oil.